Adding multimedia learning objects to your course design can enhance how your students process raw information to build meaning and understanding. Examples of learning objects often include Websites, videos, animated simulations, and computer programs. However, games are one of the best types of learning objects. They provide students with fun, low-risk, self-directed opportunities to practice what they are learning. Instructors can easily create their own Web-based multimedia learning games using WISC-Online’s GameBuilder. If you’ve never heard of WISC-Online before, it’s a digital library of Web-based learning resources developed primarily by and for Wisconsin Technical College System (WTCS) faculty. MATC faculty and staff qualify for free access to these materials by signing up for a WISC-Online account. 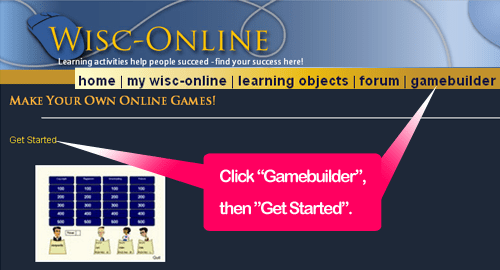 GameBuilder is WISC-Online’s easy-to-use Flash game-making program. Once you have your WISC-Online account, you have free, unlimited access to build as many games as you need. The games are built using templates and played online. 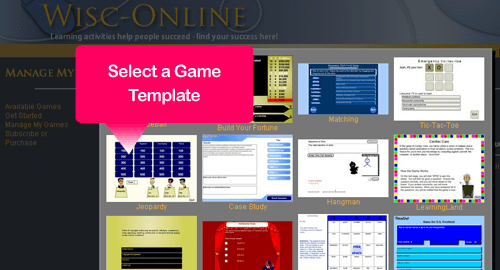 Making a game is as easy as choosing a game template and adding your content; templates include: Baseball, Jeopardy, Wheel of Fortune, Case Study, Hangman, Quiz, and more. How Do I Gain Get Access to GameBuilder? First, you have to go to the WISC-Online website and sign up for your free account as faculty or staff. 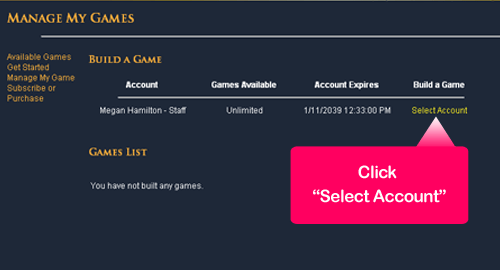 Because Wisconsin Technical College System faculty and staff members have an unlimited account, they do not need to purchase a subscription to GameBuilder. You will be able to start creating games with GameBuilder as soon as you have your login credentials set. Before you begin creating a game with GameBuilder, I recommend compiling a list of text-based questions that you want to use in the game in a Word document. Creating your content ahead of time will make the game building process much easier and time efficient; you will simply copy and paste the questions and answers into the game template’s text-fields. As soon as you have your content organized and are logged into WISC-Online, perform the following steps. 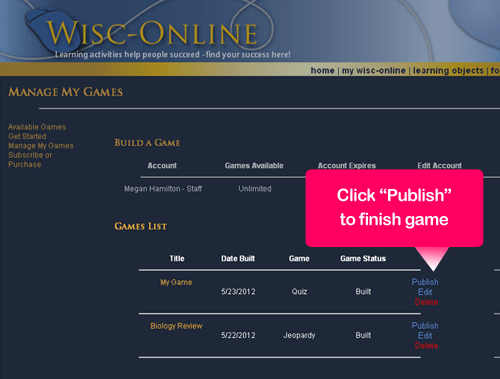 Click the GameBuilder link in WISC-Online’s main-menu bar at the top of the page. On the page that follows, click the “Get Started” link. On the following page, click the “Manage My Games‘” link. On the following page, you will see a table displaying your account information and a column called “Build a Game”. Click the”Select an Account”  link that appears in this column. Next, select a game template from the table of options that appears on the screen. In this example, I will choose the Jeopardy quiz game template. Once you select your game template, you will see a page where you can begin customizing your game’s format, adding your title, questions, and other content. Simply follow the instructions provided on the template. For example, my Jeopardy template will prompt me to create one to four categories of question, and then create 5 multiple choice questions per category. When you are done completing the template, you will be taken to a page to preview and interact with the game. How Do I Edit My Game? The easiest way to edit your game’s content is to click the “My WISC-Online” profile link from the website’s menu at the top of the page. Your profile page will contain a My Games module that lists the games you have built, as well as links to edit or delete them. Simply click the “Edit“ link associated with your game and you will be able to revise the content and settings you indicated in your game template. How Do I Share My Game? You must first publish your game so that you may share it with others. Follow these steps. 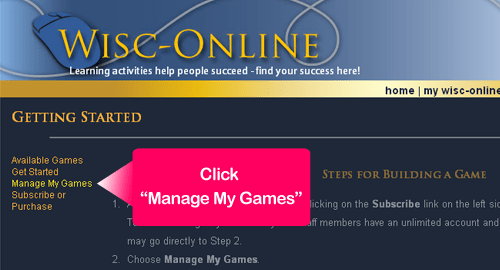 Go to your “My WISC-Online” profile page and click the “Manage My Games” link. On the “Manage My Games” page, click the “Publish” link next to the name of your game. The game’s status will change to “Published”. Next, open your game in your Web browser by clicking on the name of your game as it is located in your “Games List”. Then, copy the address that appears in your browser’s address bar. Once you have copied this URL Web address, you can paste the URL in a Blackboard Item or create an external link button in your course menu. Because the game is hosted at WISC-online, students can access your game from any Internet enabled computer that supports Flash content. The student just has to click the link to your game to start playing. 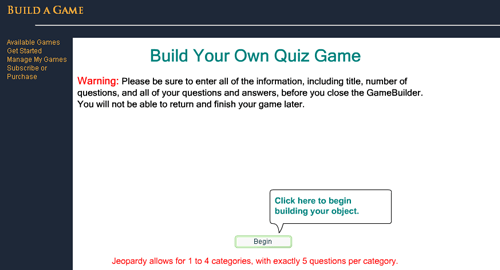 For a finished example of a Jeopardy-styled game, click this link.